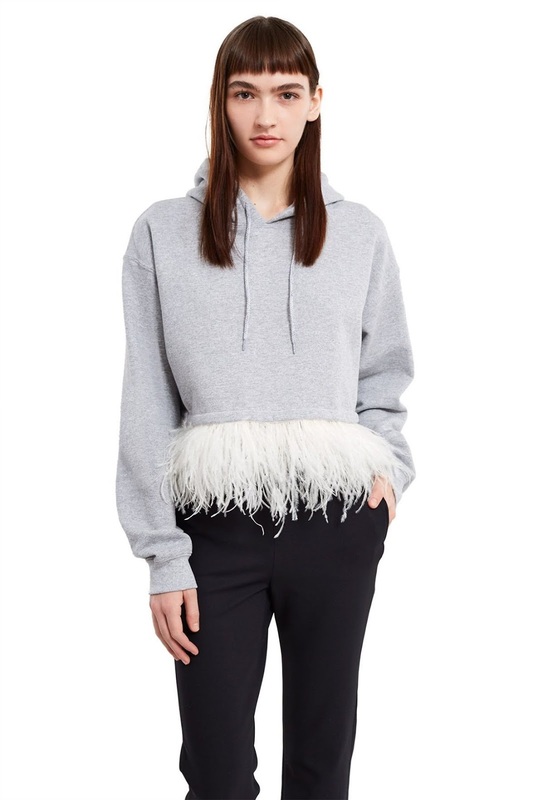 Get ready to see lots of feathers in this year's fall/winter fashion lines. Just from the first two things that I saw it seems that the feather trend is going to be bigger than usual this year. I am just going to start off with what was written in vogue and after that I am going to show you a super easy DIY project that can make a great Christmas gift. Yeah that's right, you need to start thinking about those already. So this article by vogue is a great, super short history, of our modern day feather fashion. And then at the end they give you a nice little intro to this year's feather fashion trends. I just picked this picture to share with you because I thought it was really interesting. It's a style by Prada which I have written about in the past. The second thing that I read was this post on refinery29.com. They have a great collection of awesome feather fashion for this year's fall and winter. But the one that I wanted to talk about is this feather trim hoodie from Opening Ceremony. But the problem is it not available anymore. The good news. .. It's super easy to make your self. All you need to do is get some of our feather trim and sow it into the inside bottom part of your favorite hoodie, and bam there you go. And like I said, it can make a great Christmas gift.